Let’s start with Dreamhost Hosting Review and Rating. Dreamhost is one of top ten hosting providers in the hosting industry. It has to have a huge customer’s base. Dreamhost hosting has achieved the best customer service 2016 by the host advice, and it also won few more awards like the top 25 scale-up awards and freedom-centered workspace award, etc. Dreamhost hosting is an award-winning web hosting. It’s having a large customer base, and its customer satisfaction ratings are good in terms of reviews. Now let’s find out the Dreamhost hosting review 2018, and find whether it is worthy or not. To know more about the DreamHost hosting let’s take a precise look at the features and pro and cons of the DreamHost. Before knowing about the DreamHost hosting review 2018, let’s find out what’s that company is really up to and its standards. Dreamhost is one of the leading web hosting company in shared web hosting, and it also provides the VPS hosting, dedicated hosting, WordPress hosting and cloud storage. It’s currently hosting 1.5 million sites worldwide which is an enormous amount and it’s having 400,000 plus active customers who are recommending others. Acquiring customers trust is most important in the today’s digital age, and earning million plus customers is not an easy task, but Dreamhost has achieved it. Dreamhost is an ancient site which is founded in 1996 by a few undergraduate students at Claremont College in California. They have achieved lots of milestones since they launch, and it also achieved PCMAG”S Best hosting service awards two years in a row. Let’s have a look have its features. Dreamhost is one of the best hosting providers with the best features. Dreamhost is having shared hosting, managed WordPress hosting, dedicated servers, Virtual Private hosting and also the cloud services. The most popular hosting in the DreamHost is shared hosting, and it’s having many features which satisfy the customer needs pretty well. You can get a free 1 year domain name of “.com, .net, .org, .info or .xyz” domain names for the first year. It gives the SSL/TLS certifications for free. The hosting setup is free, and they don’t charge anything at the start. It offers the domain privacy protection by the anti-spam and WHOIS privacy scans, and it’s free of cost you don’t have to spend money on that. Dreamhost is providing unlimited storage and bandwidth space where you and build your site, and you’ll never have to worry about the traffic limits and all. It’s having unlimited domain hosting where you can host and manage as many websites and domains as you’d like within one account and there will be no extra charge for that, and that’s one of the best features in this plan. This hosting provider offers the unlimited email accounts where you can create and manage as many email address as you can with unlimited POP/IMAP/SMTP accounts. Along with these you also get unlimited autoresponders and more. It is having the best customer support and it provides help every day they are available for you 24/7/365. You can contact them through live chat, email, and Twitter. Unlike other companies, this company offers 100% uptime guarantee but it can’t be achieved all the times although they are working hard to build a rock solid 100% uptime. 97-day money back guarantee, this is the best option in DreamHost, and they are perfect for this plan. They return all your money if you cancel before the 97th day. It takes the domain and other charges like the other web hosts. These are the key features of the DreamHost, let’s know more about the DreamHost by its pro and cons. There are lots of plus points for the DreamHost. I’ll clearly say the exact and genuine plus of the DreamHost. Uptime is the crucial factor so DreamHost is working a lot to provide the best uptime. Although they promised the 100% uptime but practically maintaining that uptime is simply not that easy for any hosting company. But this company has a unique rule that if at all you have faced any sort of bad experience for a day or hour of downtime for your site then the company provides your site with an extra day and hours according to the time loss. As per statistics and Dreamhost is having best uptime and over 12 months of time it has delivered 99.98% uptime easily, and they have proved themselves that they are not less than other hosting giants. 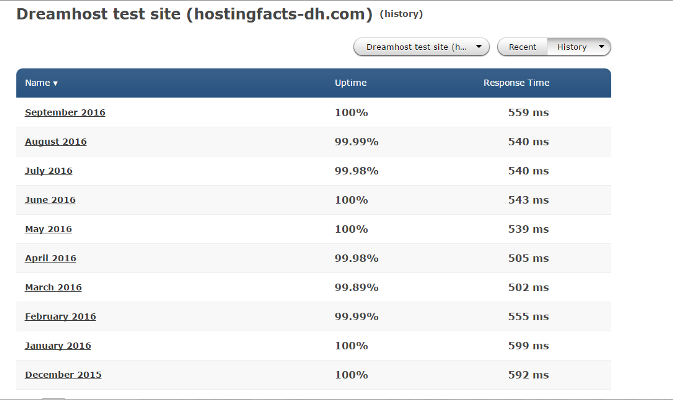 These are the uptimes of the DreamHost and it maintains better uptime. Dreamhost pages loading time is pretty faster than its average competitors. It didn’t go down from past twelve months. And it has increased its speed, and it’s presently faster than 32% of other average web hosting companies in the report of hosting facts. These are the page loading times of the DreamHost, and you can see they are good, and they maintain average speed and also provides 32% better speed than other web hosting as per hosting facts. As I already said above that, it has won the best customer service award. And it has won that award because of its remarkable efforts of the customer support. It’s having best technical staff, and they respond to your comments pretty faster. Mostly you can connect with them within the span of 5 min to 10min. Their support staff is not outsourced which is unique, and they are available for 24/7. But the drawback is it only offers, live chat, twitter, an email there is no phone support. The best feature of the DreamHost is it offers the free days and hours for the downtime your website caused. If you got a downtime for few hours on a day or a day, then they will apologize and give you an extra day or hours by considering the loss you got on downtime. And they are really doing that; it’s a cool feature. Along with these pro’s, it’s having, even more, pros, but I have mentioned them on the features. So, now let’s talk about the cons of the DreamHost. Dreamhost is having some cons like other web hosting services as well. Dreamhost is not ideal for all of the customers. It is only best for people who are having some money in their pockets. Because it’s not that affordable for the people, who are having a low amount for their websites. It’s not that ideal for all the people. This Dreamhost is quite expensive and is more than other web hosts. Generally, a starter can start with $3-4 per month on shared hosting for few hosting providers. But the DreamHost starts at $7.95. And that too if you pay for three years at once or else its one year charge will set back to $9.95 per month. As the company says that it’s having a free setup. But the new customer’s accounts need to be verified to setup. That means registration is instant, but the verification can take a few hours. Dreamhost is not having the Cpanel. Yes, it’s hard to digest, but Dreamhost has created their own control panel to provide a streamlined version for all non-techiest. Starters and non-techies may like this Cpanel, but professionals won’t like it a lot because they approach Cpanel to improve. These are the main cons of the Dreamhost web hosting. And I hope you got a proper idea of the DreamHost pros and cons now. Now, it’s time to conclude. This is all about the DreamHost hosting review. I hope you all got a clear view of the DreamHost review. If you have any queries about the review or need help or if you want to share your experience with us. Do comment us; we’d love to hear comments from you. And I’d love to engage through comments so, have a doubt or suggestion drop a comment let us share views which will help others as well.